The first volleyball history section was about volleyball origins. When was volleyball invented? Who invented volleyball? Where? How? In this section we go through the development of volleyball into a more competitive sport. In these next 20 years of volleyball history the rules became clearer and the game more competitive. The world is really catching on and participating in this great sport. How the rules developed and the game changed in the era? 1932: Time outs are limited to 1 minute. It is allowed to step outside the own court side in order to make a play, but the player can't switch position in the line up. 1933: In the USSR the first national championship is held. 1934: National volleyball referees become part of the game. 1935: A player commits a foul, if he touches the net. The players' positions are marked with the crosses on the floor. No one is allowed to step off of the court as long as the ball is in play on the spiker's side. This rule is made so that spikers do not get a running start from far away of the court. Spikers used to go off the court, run and make a one legged jump to spike the ball. 1937: It was allowed to contact the ball multiple times in defense when defending against hard driven spikes. 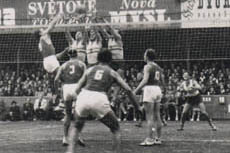 1938: Blocking is recognized as a valuable technique and is officially introduced into the rules. It is the Czechs who perfect blocking. It was in 1920's when the first attempts to block the spike occurred. 1939: Two guides are created to bring together the rules of volleyball throughout the world. The Annual USVBA Reference Guide and the Official Rules of the Game of Volleyball provide very useful information on the game. 1940: The creator of volleyball, William G Morgan, dies at the age of 68 very pleased with how his idea has developed into a worldwide passion. Timing is tested in volleyball. A game with two twenty minutes sets - and a game in which actual play time is 8 minutes were tested. Timing ideas found only a litte support. 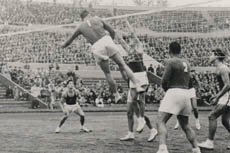 1942: In the Second World War volleyball is a hit among the troops. The Chiefs of Staff encourage the sport among the troops because it keeps them in good shape and teaches them how to work together as a team. It is allowed to hit the volleyball with any body part above the knee. 1943: Ideas about an international volleyball organization are developing. 1947: This is the point in the history of volleyball where American and European rules for the game unite. In Paris 14 federations formed the Federation Internationale De Volley-Ball and Frenchman Paul Libaud is the first president. Only in Asia are the rules different. In Asia there is no rotation of players and on the court the players are arranged in 3 lines of 9 people. 1948: The first European Championship is held in Rome. Czechoslovakia wins the tournament. After the war the rules of the game are rewritten so that they can be better understood. A better definition is given to blocking. Service is limited to a small portion of the back court. Each player must be in their right place during the serve. Rest time between one game and another is set at three minutes. 1949: The first Men's World Championship is held in Prague. The USSR wins. The use of back row setter is allowed, which leads to three player attack in the front zone.